The American kestrel nested for the first time at Tarlatt in 2018. This male is acting like it will happen again in the Tarlatt nesting box. 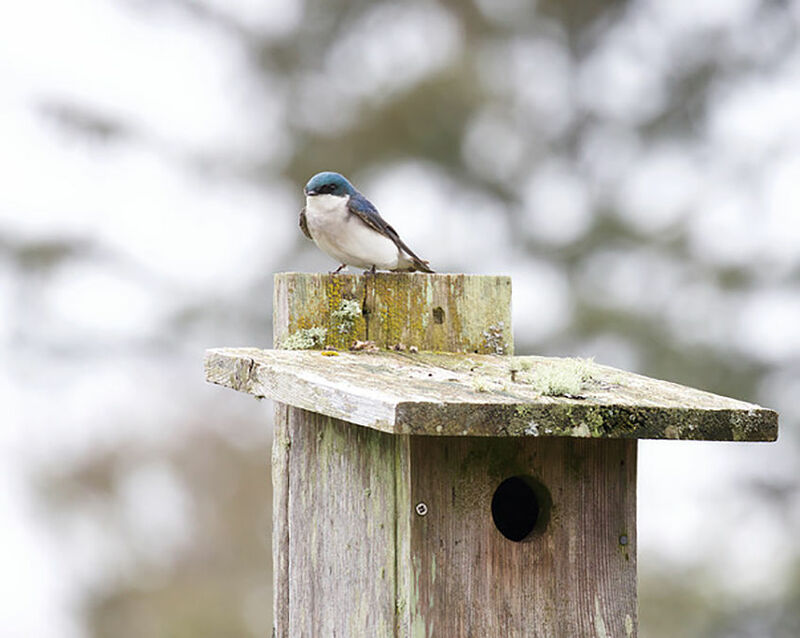 Tree swallows were seen at Tarlatt on St. Patrick’s Day. The kiosk at Tarlatt is an ideal nesting location for the black phoebe and the barn swallow. The barn swallow prefers to build its nest on man-made structures like the kiosk at Tarlatt. Lately, the Tarlatt Slough area of the South Bay Unit of the Willapa National Wildlife Refuge has been on my mind. Why, you might ask? Well, in the last few years exciting bird activity has been happening. A few years ago western bluebirds visited the nesting boxes on 95th Street for the first time ever. The one that was chosen provided evidence of at least egg-laying when my friend Susan and I cleaned the boxes. In addition, the pair was around long enough to make me think that their nest may have been successful. So for the last two years I and friends who volunteered, kept an eye on the nesting boxes to see whether a pair of western bluebirds returned. When the new kiosk went up at the end of 95th Street, a barn swallow pair built a nest. This was a new nesting record for the refuge and the Peninsula. Barn swallows prefer to build on man-made structures so the information kiosk fit the bill. Their neat cup-shaped nest has always been placed on a beam or against a suitable vertical projection. It is built of mud and mainly by the female. It is almost a certainty that a barn swallow will once again nest on the kiosk structure. This year there is a new bird on the block, the black phoebe! Three of us observed it flying off and on a fence wire like a flycatcher as it snatched insects out of the air. We watched in awe from the photography blind. Black phoebes have been extending their range into the state of Washington, and we hope it is here to stay. As one of my previous articles stated they, like the barn swallow prefer man-made structures on which to build their nest. That means, if the phoebe stays at Tarlatt, it could choose the photo blind building or the kiosk as a nesting sight. The most exciting of the bird stories from Tarlatt in that of the American kestrel. Last year, the female chose the kestrel box located in the first field on 95th Street. You will remember that they dated on-line for a while. Well, they are now dating on-line quite frequently. I have a pair of them every day that I have visited Tarlatt since the young left the nest in late summer last year. Others have seen them too. This nesting was also a first for the refuge. Not to be outdone, 85th Street also had a happening in mid-March, actually on St. Patrick’s Day. The tree swallows returned in huge numbers to claim a nesting box. I looked for a violet-green swallow, but didn’t find a one. Ninety-fifth Street was also inundated with swallows looking for a home in which to raise their young. It is hoped that these important and exciting happenings will repeat or begin anew this year. A nesting black phoebe and a nesting American kestrel would be extremely interesting and would add to our knowledge of these species, especially in our area and environs. American kestrels have been on the decline, for example, due mainly to a lack of insects, especially their favorite, the grasshopper. A nesting black phoebe would help to confirm that it is indeed extending its range into the state of Washington. And last but not least, the swallows deserve a look. Are the boxes on both 85th and 95th fully rented out? Are there any violet-greens among the tenants? So the stage is set for some exciting possibilities at Tarlatt. I hope you be able to get out and go birding there. If you do, record what you see and please keep me posted!